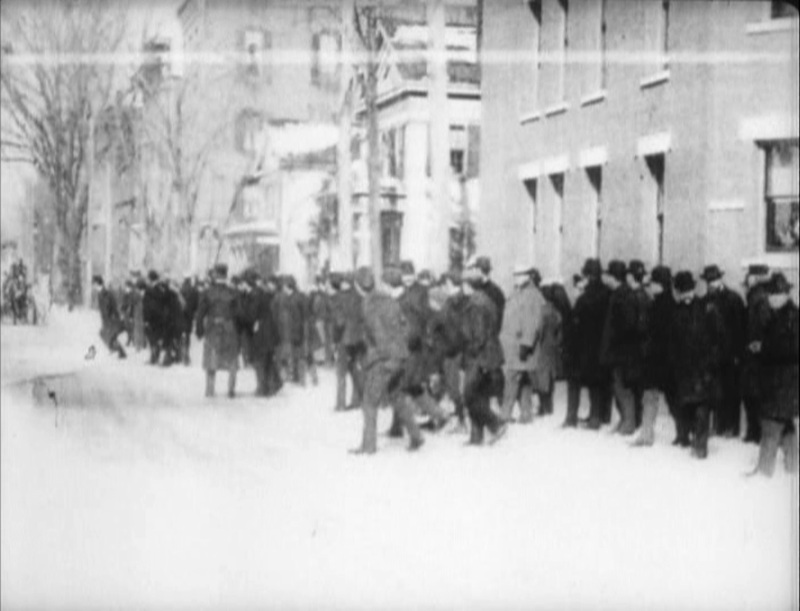 This short from Edison Studios emphasizes motion and the excitement of a fire alarm to provide a thrilling “local view.” Shot in Harrisburg, as was “The First Sleigh Ride,” it is part of the location shooting that Edison engaged in to attract local audiences to screenings. We see a street at a forty-five degree angle, on a cold day with snow on the ground. There are warmly-dressed spectators (apparently all men) lining the side of the street we can see. 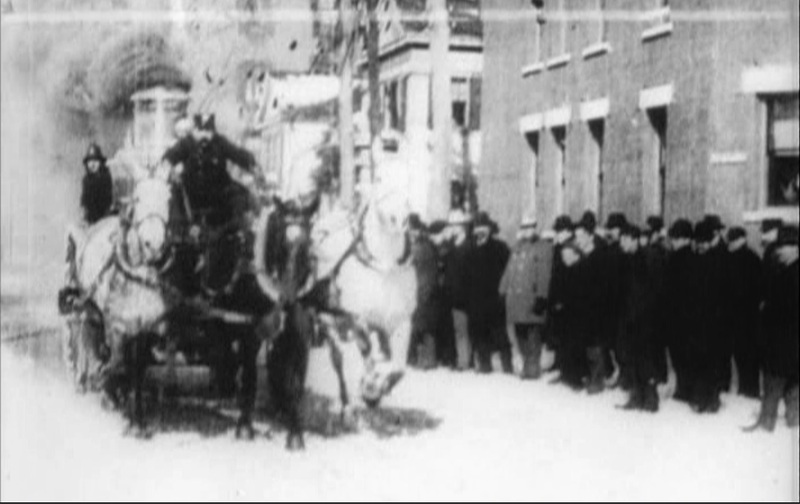 Horse-drawn vehicles charge past the camera, some with ladders or tanks of water, others carrying uniformed firemen. One of the tank-carriages belches smoke or steam as it races by. During a gap in the vehicles, several spectators enter the street to look up and see the next carriage approaching. A policeman ushers them back to the sidewalk before the horses arrive. This movie is often confused with the one I’ve labeled as “A Morning Alarm,” and in fact the Library of Congress has this listed as “A Morning Alarm” and claims it was shot in Newark. I’m following the information from the DVD set “Edison: Invention of the Movies,” which tends to confirm information from Charles Musser’s Before the Nickelodeon. LoC could be right, however their description of “A Morning Alarm” mentions “the opening of the engine house doors,” which is visible in the other movie, but not this one, so I’m trusting Musser. The spectators in this movie are clearly interested in seeing the spectacle of their local fire department in action – they pay some attention to the camera, but actually endanger themselves to see the fire trucks, so I don’t think they are actors.